The Body Engineer: What Happened to Fruits Image? Fruit has been given a bad rap! Ripe fruit can be sweet and unfortunately has been lumped into all the other problematic sugars that we consume. It has become so bad that even doctors tell their diabetic patients to stay away from it. What they don’t realize is that fruit can be the very thing that gets their bodies accepting sugar again as it’s main energy source. Diabetes is part of a larger problem that has been labeled Syndrome X in the medical community. Syndrome X is a a condition where the cells of the body stop accepting sugar, mainly glucose, which then leads to chronic inflammation, and then to many of the diseases being treated today. The key to reversing this stubborn condition is to clean up the Urinary System and Digestive System and train the body to accept sugar again with a diet high in fruits and vegetables. When the body has been using the wrong foods for fuel, overtime the systems of the body get congested causing malfunctions in the organs and glands. Fix the systems, fix the organs, and reverse your disease. This can be a difficult task when organs are backed up, the cell membranes are loaded with heavy metals and chemicals, and chronic fatigue has set in causing the person to not have the energy or focus to make the necessary changes. Is a stubborn metabolic condition where the body has been fed the incorrect fuel for too long and is no longer accepting sugar. The inflammation that results beats up the body in a variety ways. If you can train the body to accept simple sugar again you can reverse disease and prevent dozens of disease processes from developing. The main reason I push fruit as much as I do is that it always gives me the best results when I am helping restore a patients health. If you want to give your body a huge break with digestion then fruit is your best remedy. When you eat fruit all the digestive organs get a chance to rest. The UPPER GI (stomach, pancreas, gallbladder, and liver) do very little work. The acids and salts in the fruit help heal the UPPER GI and loosen abdominal fat that has accumulated in the mesenteric fascia. The LOWER GI (small and large intestine) also get the benefit of the acids from fruit digging at sticky, stubborn mucous membranes and mesenteric fascia. Scientists have began to study further into the mesentery and are finding it as a major source of disease. The abdominal fat and protein that is stuck in between the organs, in this mesentery, is responsible for the same diseases as Syndrome X and other serious degenerative conditions like cancer, Parkinson’s, and Alzheimer’s. Another great benefit of fruit is that even the waste left over, the fiber, feeds the good bacteria in the gut and ensures stool is properly eliminated. Starting with a high fruit diet is not always easy and can be a bit shocking to a body that is stuck and congested, especially the mesentery. Getting through a stuck mesentery is the toughest thing one can do and is necessary to reverse disease and restore health. The yellow tissue is the mesentery and it wraps around all of the organs and then extends to the entire muscle system of the body. 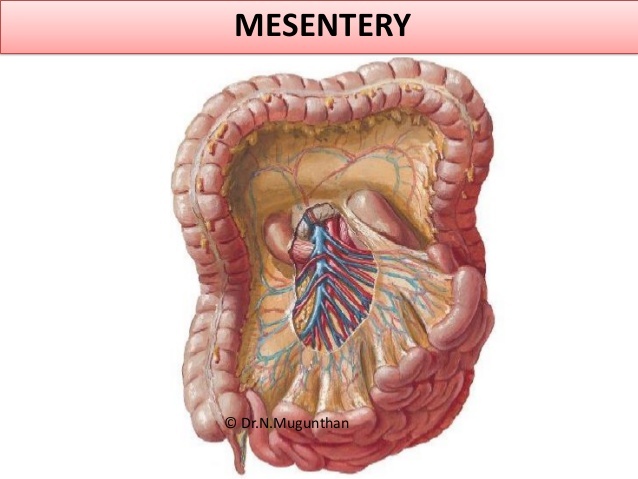 The mesentery is a major highway for nutrients that heal our body and keeps the entire body loose. Fruit is a natural astringent and puller of toxins. This is because of the salts and the acids that are in the fruits. Fruits move very quickly through a body and when they hit an area of congestion they go to work immediately. Many feel less than satisfied and often are hungry when they start eating fruit. I tell my patients if they are hungry when starting to more fruit then they are just not eating enough. Instead of an orange, eat four of them, eat an entire cantaloupe, make yourself a big bowl of fruit. With just one meal of fruit a day you can hit all your daily allowances for vitamins and minerals along with many other healing capabilities. The acids in blueberries do all the magic! Citric Acid, quinic, malic, succinic, tartic, shikimic - these acids decongest the body, reduce inflammation, and reduce blood sugar levels in the blood. I know what you thinking. All that sugar! Don’t worry, it's the best fuel on the planet. All that I’m asking is if you have trouble truly feeling good, physically and emotionally, then take a different look at fruit. Fruit has the ability to help you in many ways. The fruit vegetables are also very effective in restoring blood glucose levels, reducing inflammation, and reversing Syndrome X. Some of these include cucumbers, tomatoes, zucchini, eggplant, and peppers. You must be careful with these fruit vegetables and remove the skin and seeds just like you would a fruit. The inflammatory lectin protein resides in the skin, seeds, and leaves of vegetables and needs to considered when being prepared. Juicing veggies is much easier on you and you will get more of the nutrients out of the vegetables. If you do juice, it’s a good idea to put some of the fiber back in to the juice to slow down the insulin response from the concentrated glucose. The fiber is important for healthy bowel movements, keeping the gut clean, and for feeding the good bacteria in your gut. Fiber is considered a prebiotic and you will see it sold on the market as such. In the beginning of care, especially with chronic case, I generally do not supplement with a lot of fiber when I’m getting someone’s GI tract running smoothly again. One reason is that they will be getting plenty of fiber with the new fruit/veggie diet they’ll be on, and the other is that fiber alone can start to back everything up in the bowels if too much is consumed to fast. The fiber in fruit has that amazing ability to dig into the bowels and clean deep into the folds of the small and large intestine. It has been shown through dozens of studies linking a healthy bowel as a necessary first step to correcting any disease process. At Panacea we correct the digestive system as one of our primary goals. Visit Panacea Nutritionals and find your own healing remedy.